You must register by February 15th, 2019 to receive a T-Shirt. IMPORTANT: If you are a minor your parents or legal guardian MUST print out and sign the competition waiver in order for you to participate. For OPEN Class climbers only. For BEGINNER, INTERMEDIATE, or ADVANCED climbers. You will choose your category at checkout. 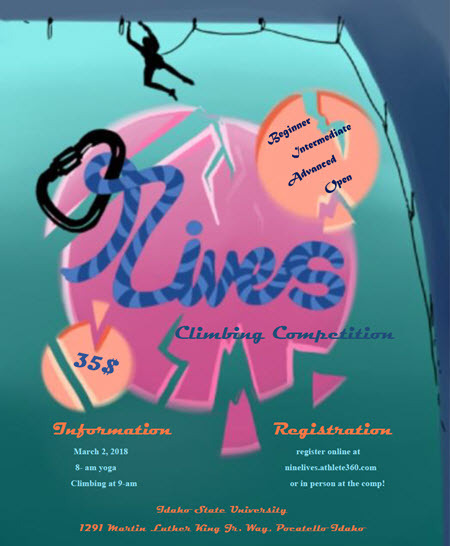 he Idaho State University Climbing Sports Club is putting on the third annual Nine Lives Climbing Compeition. Come join us for a rad day of climbing! There will also be yoga, games and a raffle. A special thank you to Premier Technology in Blackfoot, ID for donating their time, skill and material for our medals!! Pre-register by February 15th and you're guarenteed a sweet comp t-shirt! If you missed pre-registration you'll still have the chance to purchase a shirt the day of. MINORS (under the age of 18): Your parents or legal guardian MUST print out and sign the competiton waiver in order for you to participate.